Receiving “Invalid Argument” error message frequently in your Access Database File? Especially while running an append query, import data in large Access Database file or run a make –table query. Looking for some instant fixes to resolve this Access Database ‘Invalid Argument’ error message? Well for this you need not to go anywhere as in this tutorial you will get the most appropriate solutions to resolve MS Access invalid argument error message. So, learn how you can fix this by your own…! Let’s start with the practical scenario first…. I am using a MS Access 2010 DB that was upgraded from MS Access 2007. When I run a simple UPDATE query (e.g. as follows) that works fine in MS Access 2007 version, I get the pop-up error message “Invalid Argument”. Another weird phenomenon is: when I manually change some values using copy-paste upon the table, the error “Invalid Argument” pops up too; if I ignore it and continue pasting the new values, the update can be done. How to deal with this issue? Got pop-up “invalid argument” error message when using UPDATE query in MS Access 2010. This error itself signifies that users can’t open MS Access database to do any kind of activity because MS Access database is fail to work. This invalid argument Access error especially occurs when anything goes awry with database that results to inaccessible Access Database. Here is the listing of some most common conditions that are very much responsible for Access Invalid Argument error message. When users import, copy, append data like operations to a table in MS Access. Presence of the some corrupt records in Microsoft Access MDB or Accdb file can also be the reason of this error. Problem occurs also when size of the Access Database file exceeded 2Gigabyte (GB) size limitations. 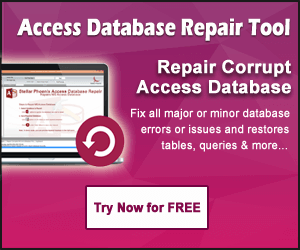 How To Fix A Corrupt Over-Sized Access Database Manually And Easily..? This will open a new window. Now in the Message Tracking tab, select for the most recent tracking file in the list. Click to the delete option. If it works then delete the next one after it. Once you have deleted 5 to 6 data imports, go to the File > Database Properties and now try to compact the database. Note: if you want to compact a shared access database file that is located on a server or in a shared folder, you must need to be sure that no one else on the network has opened the access database file at the same time. You must have to use your Access Database file Exclusively. Start your MS Access Application. Database Utilities, and then click Compact and Repair Database. In the compact database into dialog box, select the name of the compacted Access database file. At last click to the Save option. Open the Access database file that is having the issue. On the tools menu, point to the Database Utilities in the database window and then hit the Database Splitter. Note: if you are an Access 2007 application user then click the Access database in the Move Data Group on the database tools tab. In the Database Splitter dialog box, click split database option. In the Create Back-end Database dialog box, type a name for the back end database file in the File name box, and then tap to the Split option. Finally hit the OK option. Now you must have got the complete idea on how to fix this Access ‘invalid argument’ error message. But if in case all the aforementioned fixes fails to resolve ‘invalid argument’ issue the try using Access Repair And Recovery Tool as it is the best suited option to fix any kind of error blot occur in access database. 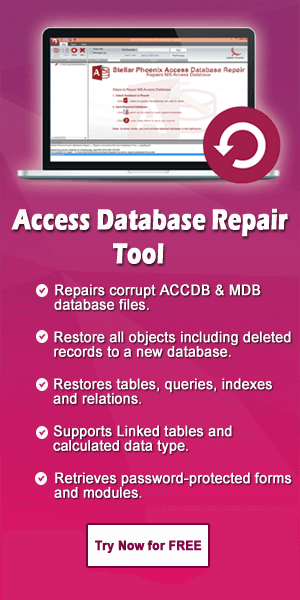 With the help of Access Repair And Recovery Tool one can repair and recover the damaged, inaccessible or damaged database. It easily recovers the database from any sort of corruptions; it restores the corrupt index, table, relations and query. It also recovers password protected forms or modules.